The Italian walnut used on the Pianosa is claimed to offer some unique advantages too, as it is extremely dense but has good damping properties at the same time. When you lift the deck you can feel how its weight comes mostly from the wood. OK, so Panzerholtz it isn’t, but neither is it made from balsa or cheap MDF. In fact, Gold Note claims only Italian walnut can offer the correct damping effect, in the process providing stabilisation, insulation, and rigidity to the turntable just on its own. However, it is also extremely difficult to work with and it takes a skilled craftsman to create unusual shapes - as on Pianosa - and to treat it properly. It is also expensive and rare. The shape of the wooden plinth has been developed as an arch. Gold Note industrial designer Stefano Bonifazi used the mathematics behind the catenary curve to solve two problems at once: giving the best support and insulation from the surrounding environment to the chassis while providing the rigidity and virtual mass of a much heavier object. The spindle/bearing system allows the turntable to achieve higher precision and control over the rotation of the platter. It also increases the overall rigidity of the system and ensures perfect alignment, in axis damping effect, and less potential oscillations. Like the choice of the wood, this long spindle/bearing system requires very precise processing of every single metal part. The DIN connector used is the German DIN standard and differs from the common - at least for the hi-fi industry – SME model. Gold Note adopted the standard DIN as it feels this is the “real” DIN and in the opinion of the designer it sounds the best, too. Gold Note uses Hirschmann connectors made in Austria, and premium versions of the phono cable are available as an upgrade. 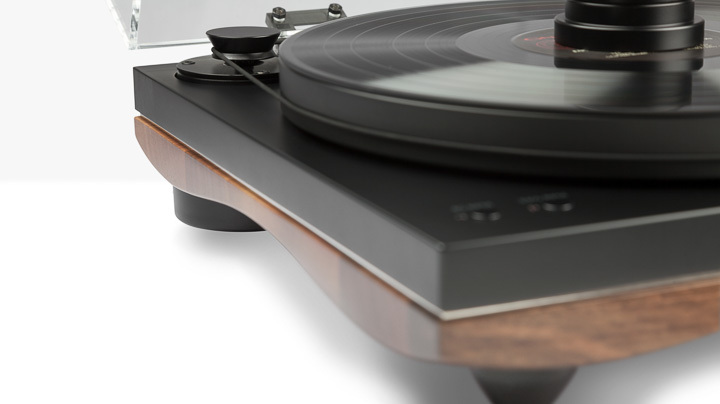 Installation and set-up of the turntable is exceptionally easy, laying to rest the notion that high-end turntables are deliberately opaque in their installation so that the dealer can charge for set-up. It’s Ikea-grade simple to put together, although the manual does come with some helpful installation tips (such as the four-second ‘power chord’ required to switch from start/stop to speed adjustment mode). The arm in particular is extremely easy to use, and unless you are all thumbs, you’ll be fully set-up and running in no time (you’ll need a stylus pressure gauge, but not much more). In turntable making, once you get past the super-cheap, there’s two or three clear sonic directions that turntable makers follow: ‘detailed’ (as in ‘bright’), ‘majestic’ (as in ‘warm but slow’), or ‘rhythmic’ (as in ‘the no-bass bounce’). The best of them combine two or more of these elements to make a sound that is well-balanced, and it’s this well-balanced approach that is what the Pianosa is so good at providing. There’s no exaggeration or marked emphasis to the presentation (although if you are looking for a sonic disappearing act, keep looking; the Pianosa trades absolute neutrality for a sound you want to listen to, instead of one you want to analyse). It’s an incredibly refined sound, too, the kind you normally associate with very expensive audio equipment. I played the Overture from my now almost worn-out copy of The Pirates of Penzance [D’Oyly Carte, RPO, Decca SXL], which is on the one hand perhaps the LP with the most natural soundstage I possess, and second a damn enjoyable piece of 19th Century operetta. If you find yourself playing air-triangle as I did here, you know you are on to a good turntable system. It’s not the fastest sounding turntable around (the emphasis is on image separation, coherence, and musical interplay) but what it perhaps lacks in four-on-the-floor rhythm is more than made up for in effortless dynamics and the sense of everything being musically connected.